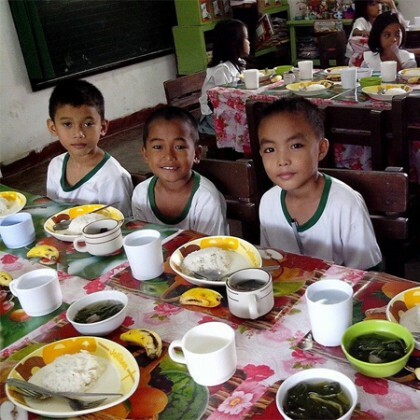 The Jollibee Foods Corporation (JFC) through Jollibee Group Foundation in partnership with Alrose Group of Companies embarked on the Busog, Lusog, Talino (BLT) School Feeding Program. BLT brings together schools, parents, local government units (LGUs), donors, civil society, JFC and AGC employee volunteers to address hunger among pupils, helping them to stay in school and learn better. Alrose Group of Companies became the Local Implementing Partner (LIP) of the said program which have a 5 schools recipient in year 2012 and 7 schools recipient in year 2013-2014. The following are the schools beneficiary of the BLT program. Daily lunch: In each school, the 40 most undernourished pupils in Grades 1 and 2 are selected and provided with lunch for 136 days, from July to March. Parent involvement: Parents of BLT pupils take the lead in food preparation and budgeting so that they can learn and apply these learnings at home. Stakeholder engagement: The BLT program is designed to involve different members in the community. In each site, JF implements the program with a Local Implementing Partner (LIP) that operates like a franchisee in the area. The LIP works with principals, teachers, PTA members, local government health and nutrition workers, and other volunteers to make sure that BLT will work. Employee Volunteering: Monitoring is done with the participation of JFC store volunteers. This is where the presence of the Foundation is felt as JFC employees serve as its ambassadors. In 2 years of BLT in Iligan, one of its goals is to achieve a 90% normal BMI status in every 136 days feeding cycle in each year from July 2012 – Feb. 2013 and July 2013 – Feb. 2014. The following are the results of our 2013-2014 feeding days cycle. BLT pupils became active in class and perform well.